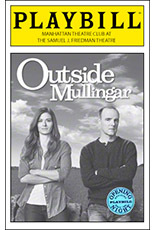 It's such a well-crafted play, he contended, that you don't have to be Irish to do a good job of directing it. "I'm only partially Irish myself," he demurred. (His father was the definitive Da, the late, great Tony winner, Barnard Hughes.) "I spent a lot of time in Ireland, and I'm the proud bearer of an Irish passport. It doesn't hurt to be somewhat acquainted with the land and the people, and I certainly drew on the fact that I had wandered over those bogs and those fields with certain frequency ever since I was a teenager. But I think that Outside Mullingar is a universal work. This is a play about family life, about aging parents, about moving to the front of the line in life and realizing that time is short and, most of all, about the need for love. "There are two moments in the play where we thought we'd just let it happen — the hug in scene four between father and son and the kiss in scene seven. We just decided we were going to let those play in real time and not hustle anything along." It has been quite a while since theatregoers have been treated to a good old-fashioned kiss, and this one lasts beyond the applause it almost unerringly gets. On opening night, it clocked in at 36 seconds, which surprised its instigator, Brian F. O'Byrne. "Wow!" he exclaimed softly. "It didn't seem that long. I was aware it was a long kiss. If you waited that long for a kiss, Harry, you'd take a while as well, right?" O'Byrne found Anthony a "pretty neat" character. "He has surprising elements," the actor said. "Any character that's surprising is always fun. When you have something in your hip pocket that you know is going to be revealed at some stage, is always a lot of fun. I think he's a gentle soul, and I like gentle people. It's so far from me." Debra Messing, on the other side of that kiss, said the moment is consistently a major crowd-pleaser — one of the happy perks of finally making it to Broadway. The Emmy winner of "Will & Grace" and star of the recently canceled "Smash" made her last stage appearance Off-Broadway for Manhattan Theatre Club 14 years ago in Donald Margulies' excellent two-hander, Collected Stories, opposite Maria Tucci. As Russian Jewish colleens go, she's very convincing and boasts a believable brogue. "Stephen Gabis, the renowned dialect coach, was the man who got me ready. We worked together for a full month before our rehearsals began. He came throughout and gave me notes. We worked really hard, and I'm incredibly grateful to him." Rosemary was fun for her to play. "I had never encountered a character like that in my life in any medium. I loved that she was passionate and pure and ferocious and knowing. I loved every minute of it. It's just exciting finally to get to opening night, and we're able to celebrate. Now, I just get to do a run of a Broadway show." Dearbhlia Molloy, who plays Rosemary's ma, struck a surprisingly glamorous figure off-stage. "That's the best wig in the world. It's Tom Watson!" She was in Shanley's Pulitzer Prize-winning Doubt in England and played Broadway twice: As Gabriel Byrne's wife in the last A Touch of the Poet and as one of the three Tony-nominated sisters in Dancing at Lughnasa. "I hope this one is a great success. I like this character I'm playing here. I like that she's not sentimental, that she doesn't give a shiver about anything — except she does care about her daughter." Rounding out the four-member cast is the always-reliable Peter Maloney as the stubborn, cranky Tony Reilly. It's hard to imagine another actor in the role, but one was, and Maloney replaced him, delivering one of his best performances ever. MTC's executive producer Barry Grove admitted he wept over one of Maloney's scenes and was still welling up trying to talk about it. "It's a play that dares to stand for the heart and for big emotions," he said. "The chemistry between the two leads — and, ultimately, the chemistry among all four of them — is very strong." "It's Shanley at his best," seconded MTC's other half, Lynne Meadow, "a deceptively simple tale, but in it he examines such a range of human emotions. It's irresistible. It has sentiment, not sentimentality, and it has simplicity but with depth and wisdom." Guilty as charged, Shanley felt this was among his most emotional writing. "My heart was in it. It's a very naked play. There's nothing ironic about it. I'm not removing myself in any way. It's all just right. You do or you don't, as an audience member." How did he happen on such an offbeat title? It turns out to be something he has been saying all his life: "Anytime somebody asked, 'Well, where's you're family's farm? ', I'd say, 'It's outside Mullingar.' Mullingar is the capital of County Westmeath, and it's about 11 kilometers from the farm. My cousin, Brandon Shanley, who was born on that farm and raised on that farm, was sitting next to me tonight — he was my date — and he said, 'You know, anytime anybody asks me where I am, I always start by saying, 'Well, I'm outside Mullingar.' It's a prosaic title for a poetic play." His shy-guy protagonist is likewise drawn from real life. "My cousin Anthony lives on that farm in Ireland, and he's never married, and he's a great guy. I know him. I knew his father, Tony, and his mother, Mary — the same names that are in the play — and there are two gates to get on to the farm. Somebody else owned that piece of land, and each time I asked about it, they'd change the subject. So I made up a story." O'Byrne's wife, Heather Goldenhersh (like him, a Tony nominee for Doubt), arrived with his mom, Nancy O'Byrne, in from Ireland. 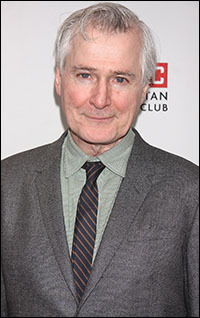 One of their Tony-winning co-stars from Doubt was in attendance: Adriane Lenox; the other, Cherry Jones, was otherwise engaged in The Glass Menagerie. And lots of Shanley came over from Ireland, too. Among the playwrights present and accounted for were Matthew Lopez, Sharr White (whose Snow Geese last occupied the Friedman and whose next, Annapurna, premieres with The New Group on Palm Sunday), Paul Rudnick, Nell Benjamin (who's working on part two of the trilogy she started with The Explorer's Club) and three of Shanley's Pulitzer Prize peers: Nilo Cruz, Lynn Nottage and Alfred Uhry. Also: Julianna Margulies; director Michael Wilson (whose Lifetime edition of Cicely Tyson's Tony-winning Broadway vehicle, The Trip to Bountiful, just announced an airdate of March 8); Peter Jacobson (who still lives in New York but commutes like crazy to the West Coast for films and television); Kate Jennings Grant and Jan Maxwell, both with upcoming plays they can't discuss at the moment (even when I told them America wanted to know); Brian d'Arcy James, who'll do an episode of Paul Giametti's TV series "Hoke," in February; Kathryn Meisle and Derek Smith, a prize-winning pair of Red Bull Theatre vets; Željko Ivanek; one of the Good People who previously inhabited the Friedman, Tate Donovan, now bound the next day for London to shoot the resumed "24" series with Kiefer Sutherland; director Walter Bobbie and his Tony-winning Venus in Fur discovery, Nina Arianda, who's returning to the stage March 18 in MTC's production of David Grimm's Tales from Red Vienna); Veanne Cox, who has snared a couple of multi-lingual roles in An American in Paris — in Paris! ; Edward Hibbert, who will reprise his 54 Below club-act, Can't Something Be Done?, one more time Jan. 28; actor Robert Emmet Lunney, who just wrote a three-character play he wants to call — Leonard Cohen permitting — Famous Blue Raincoat; Evan Jonigkeit and Zosia Mamet, a carryover duo from last year's Really Really; Anne Kaufman Schneider; set designer Santo Loquasto; producer Scott Landis and wife, director-choreographer Kathleen Marshall and Gregg Edelman.